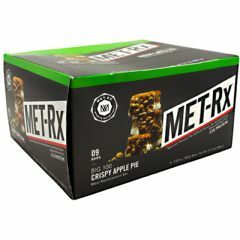 AllegroMedical.com presents The MET-Rx Big 100 Colossal - Crispy Apple Pie Meal Replacement Bar. Naturally flavored meal replacement bar. No artificial flavors or colors. 32g of protein- includes metamyosyn protein!